In 1997 graduated from Carol Davila University of Medicine and Pharmacy-Faculty of Dentistry. In 1999 he is resident physician in “UMF orthodontia” specialization. He attended a series of internationally acknowledged courses: “Straight Wire Technique- DENTAURUM” (Bucharest2003, 2004, 2005), “Incognito Lingual Technique” (Bucharest 2007), “Advanced Course in Edgewise Technology and Differential Diagnosis-Charles H. Tweed International Foundation for Ortodontic Research” (Tucson, Arizona 2008). 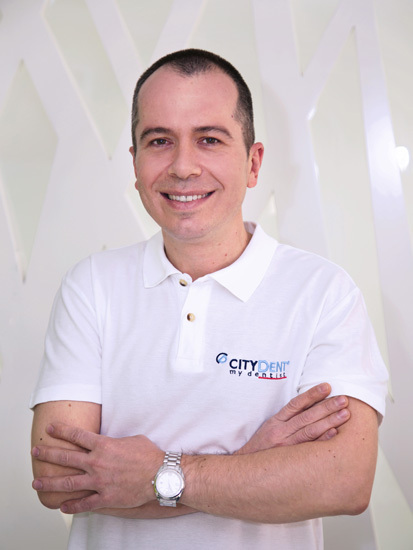 Dr. Bogdan Geamanu is an orthodontist and deals within the clinic with patients who need fixed or mobile braces. He is certified in Lingual Technology, being specialised in Incognito invisible braces. He also specialises in Sapphire and metalic braces, as well as Invisaling orthodontic retainer trays.